“Group of Women in the Ghetto,” sanguine, 1942. (in a sewing workshop, an "Arbeitsressort.” Note the young boy looking on, holding his soup can.) 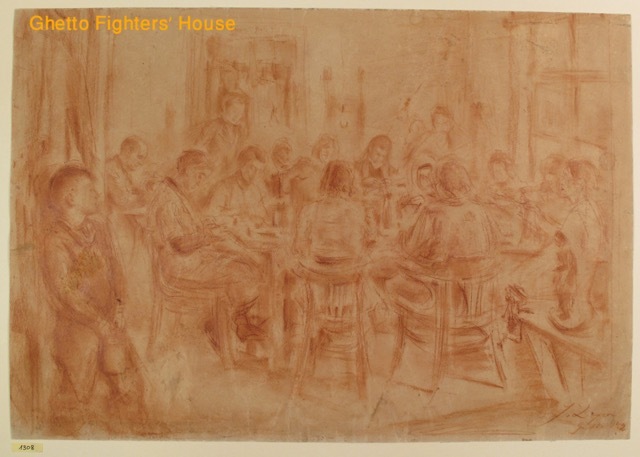 Ghetto Fighters’ House, Israel, item 1308. Gift of Nachman Zonabend, Sweden. May 1942 is when the “Scholarly” Department, for whom Lejzerowicz is known to have worked, was established. We do not know if this work was commissioned by that entity or was created at the request of the ghetto’s statistical department or others.